Apple has refreshed its iPad line-up with the launch of two new Pro models. The new models promise better performance, Face ID, and a new design among other things as the company looks to blur the lines between how we work on the go and how we keep ourselves entertained. But are they any good, have they benefited from the refresh, and can they really replace your laptop? We've been living with the new 12.9-inch model to find out. It's been a while since the iPad design has drastically changed, but changed it has with the 2018 iPad Pro models. They've taken a much more angular design reminiscent of the old iPhone 4 form factor, albeit one that is much thinner at just 5.9mm. The chamfered edges have gone and the overall measurements are now 280.6 x 214.9 x 5.9mm. It weighs 633 grams, making the new 12.9-inch model considerably smaller than the 12.9-inch model it replaces. That reduction in size - it's around 25 per cent - is thanks to Apple drastically reducing the bezel at the top and bottom to create an edge-to-edge display similar to the iPhone XS and XR models. In use, those size changes make a huge difference. The 12.9 iPad is noticeably thinner while having a good distribution of weight meaning it doesn't feel as heavy as you might expect. Don't get us wrong, it is still very large and square, but nowhere near as large as previously and that makes it a lot more practical when it comes to working on the move. It's roughly the same height as a 13-inch MacBook Pro, but around 25mm narrower and a lot thinner. The reduction of those bezels also means there's a greater sense of an edge-to-edge experience, but there's enough space in the bezels for the Face ID cameras (found at the top in portrait, the side when in landscape) for unlocking without adding a notch that interrupts the screen experience. The move to Face ID means there's no home button and means the iPad is in parity with the recent iPhone models. Sometimes you might struggle to understand which way up the iPad should be held because there's no button at the "bottom", but there is no wrong way to hold the new iPads - iOS 12.1 automatically rotates to match the way you are holding it. There is no 3.5mm headphone jack and no wireless charging, but the iPad Pro keeps the same four-speaker design, improving the speakers performance. We've found it's certainly good enough to watch TV Shows or Movies on, or listen to music while we work, with a richer sound quality. It's not going to replace headphones of course, but will be more than good enough for those using it to present in noisy environments. The iPad Pro 12.9 also increases the microphone count from three microphones to five for better audio recording or FaceTime calls. 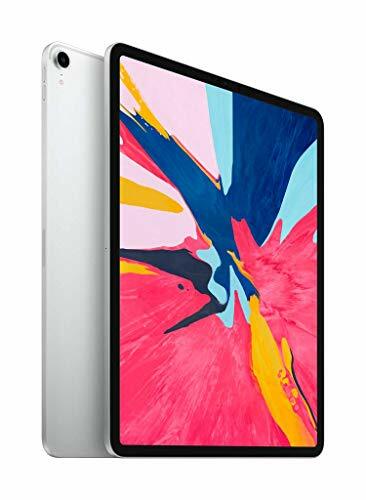 Following in the footsteps of the iPhone XR, the iPad Pro 12.9 features a "Liquid Retina" LED-backlit IPS tap to wake display with a 2732 x 2048 resolution, for 264ppi. The laminated display is anti-reflective - although still expect some glare in bright conditions - and there's an oleophobic coating that does a good, but not perfect, job of coping with grubby fingerprints. There's no formal HDR support, however at 600 nits brightness and given the screen size, we don't suspect many will notice, because this display is big, rich in colour and packed full of detail. Watching the very dark (in terms of luminance) Stranger Things on Netflix, we could still see plenty of detail on screen and that's replicated across the experience - it's a great display. The Liquid Retina display isn't the only design inspiration the iPad has taken from the X range of iPhones though. The corners of the iPad's screen are now curved to match the exterior design and that has both good and bad effects on day-to-day use. The bad is that every third-party app will have to be redesigned and updated. Apple doesn't scale apps to the edges as doing so could lose UI elements that reduce app functionality, but it means on day one your non-Apple apps might not fill the screen. Different apps react to the design differently. Some like Slack fill the width but not the height, others like Asphalt 9 or Netflix don't take any chances and leave a very wide black border on the screen giving you a bezel akin to the old iPad. We experienced similar when the iPhone X was first released and screen dimensions changed, but a year on and not all apps have taken advantage of the new size, and we suspect it will be the same here. The biggest change to the iPad Pro's cameras is the addition of Face ID to the mix on the front facing camera that's still located at the top of the device in portrait mode. Featuring the same camera that's in the new iPhones, it will certainly appeal to those looking for a quicker way to unlock their iPad. Thankfully - unlike the iPhone X range that limits you to only using Face ID in portrait - you'll be able to use the iPad Pro Face ID in both landscape and portrait modes, with the camera either at the top or the bottom. While muscle memory will see you reaching for the Touch ID button the speed and convenience it brings to unlocking your iPad is fantastic. In landscape mode with the new Smart Folio Keyboard attached it simply means pressing the space bar if your device locks. While the Surface Pro will offer Windows Hello to do similar, there are some devices out there that will prompt you to unlock by tapping in your password on the display, which now feels archaic. While the technology works seamlessly, there are times when human error has got in the way, mainly when we've not remembered where the camera is and covered it with a hand. Apple does give instructional guidance on screen if you aren't looking in the right direction as if the camera is saying "psst, over here". The introduction of Face ID also brings Animoji, Memoji and Portrait Mode (front facing only) on the iPad for the first time, including the depth of field feature introduced on the new iPhone models. Both the front facing 7-megapixel camera and the rear 12-megapixel camera feature Smart HDR too. Disappointingly the new camera loses optical image stabilisation as found in the 10.5-inch iPad Pro launched in 2017. But in reality, using a phone is much more convenient for photographs, rather than waving around your huge tablet. Overall the picture quality is great, however. How does the 12.9 iPad Pro perform? As you might expect, the iPad Pro gets a considerable power boost in this new guise. It's pretty much a laptop in terms of performance thanks to the new 7nm processor. Side-by-side with an iPad Pro 10.5 we have noticed a considerable difference in app loading times, certainly on processor intense apps like iMovie, Affinity Photo, Procreate, and games like Fortnite or Asphalt 9: Legends. Those app performance times are also helped by the A12X Bionic having a beefier seven-core GPU that delivers twice the graphics performance of the iPad Pro 10.5's A10X Fusion processor. What this all amounts to is that you're not waiting around for things to load, and if you are, then you aren't waiting for long. Games load quickly, apps run smoothly, video and large photo files are all processed with ease. That's also the advantage of using a mobile OS - the iPad offers a stable environment and a lot of these apps are leaner and faster: opening Microsoft Word on the iPad is much faster than opening it on the Mac, for example. While a full desktop environment offers some advantages - which we will address in a minute - there's a lot that the iPad Pro will do in a fast and fluid manner and often more simply than a fully-fledged notebook. Like the new iPhones, it is available with a nano SIM slot and further support for eSIM - although it doesn't go as far as supporting dual SIM. Again that gives you the convenience of being always-connected and for the mobile worker, that's not to be dismissed. While public Wi-Fi or (preferably) using your phone as a hotspot will get your old notebook connected, it's much simpler when your work machine in connected in its own right. Storage options are 64, 256, 512GB, all the way up to 1TB meaning you really can treat it like an laptop, although the prices rise considerably for the larger storage models. All that power doesn't seem to have affected the battery life although the large screen turned up bright does gobble up power fast. As does playing games or checking social media. Apple claims 10 hours of battery on a single charge, but you'll need to use it fairly lightly to get that - we got about 8-9 hours in desktop use, and fire up an intensive game and that glorious 12.9-inch display will see you burn through the battery faster. Thankfully the iPad Pro now features quick charge. Included in the box is a 18W USB-C charger that means you can charge much faster and if you're a heavy user you'll need it. Using USB-C means you can charge it with your MacBook charger and it also supports reverse charging - so you could use it to charge your iPhone if your battery is low. The move to USB-C opens up connectivity options too. You can plug in SD card readers to download camera photos quickly - it's much faster than Lightning - external monitors with apps either offering mirrored view or dual view with different things displaying on different screens, and a host of other things like Ethernet adapters or even hard drives, although the latter will need to have an accompanying app from the manufacturer because iOS 12.1 doesn't offer file directory support. This is a weakness of the arrangement - while you can connect an SD card and view image files, that doesn't apply universally to all documents. If you get handed a USB stick, there's a chance you won't be able to access the files. Currently, the app-supported devices are all centred around music or photos and that won't help someone wanting to view a PDF on an external drive. Apple offers some adapters for USB-C already, for a 3.5mm headphone socket or that SD card reader, for example, but it's day zero for USB-C on iOS so we're excited to see what third party manufacturers come up with, because this is an area that could be better supported. It terms of performance the only real difference now between the iPad Pro 12.9 and a MacBook or MacBook Air feels like the difference in operating system environment and the thing really holding the iPad back from being a full MacBook replacement are some of the shortcomings in iOS 12. The operating system is designed around using one or two apps at time, and that can be frustrating if you're multitasking between multiple apps. It can be infuriating, for example, if you're writing something in Word, researching something on the web and then having conversations on numerous messenger apps all at the same time. Yes, you can quickly swipe up to reveal the apps you have open, but at times it can feel laborious, compared to the ease of switching around a windowed desktop OS. The iPad offers an app-focused experience and takes advantage of pen input - while the MacOS goes for that multi-window mouse or trackpad approach. Both have their pros and cons and only you'll know what fits into your workflow. With the 12.9-inch iPad Pro sitting close to the new MacBook Air in terms of display space (although the aspect is different), if you don't need a keyboard, then you might find it offers all the power you need and it starts at a lower price. Personally we've found that the iPad Pro range is fantastic for working on the go and we still use the MacBook Pro for desk based work, but that line is starting to blur. We wrote this review, edited the photos and uploaded it to Pocket-lint solely on the new iPad. To go with the new iPad Apple has created a new Apple Pencil. It changes its design moving to wireless charging, a magnet to stick to the side of iPad Pro, and a new feature that will let you double tap to change tools within apps. While the size roughly stays the same, Apple has opted for a matte finish which feels better in the hand. There is a flat side to allow it to stick to the side of the iPad Pro and the magnet is strong enough that the pencil doesn't fall off, even if you shake it. Pairing is as simple as sticking it to the side of the iPad, although it's worth noting that the new Pencil will only work with the new iPad Pro models announced. Likewise you won't be able to use an older first-gen Pencil either. The ultimate designer test? Yes it fits and sits comfortably behind your ear, something that couldn't be said for that first-generation Pencil. It is an optional accessory which will cost you £119, however, so you'll really need to want to draw to make it worthwhile. Still the 12.9-inch screen certainly offers plenty of canvas to do just that. There's also a new keyboard. It now features a leather back to protect the iPad and suckers to the iPad by lots of magnets. It connects via the smart connector dots that have moved to the back and because of all those magnets, aligning the connector dots is something you don't even need to think about. Because of the design change there are two different viewing angles and no presentation mode meaning you'll always have the keys out front. The previous contortionist style approach was at times complicated and things are much simpler here, but it does also feel more like a large case. Typing on the device feels natural with the keys have a good amount of travel - certainly we've found it suitable for writing longer pieces without missing the laptop. The keyboard will cost you £199 and in reality, if you're using the iPad Pro as a replacement for a conventional laptop, it's something you'll want - but if your Pro experience is all about drawing with the Pencil, it's something you might never need. Apple has produced an iPad that we suspect many pro users will want - and not just because of the increase in screen size or the thinner design. There is so much here that blurs the lines when it comes to working on the go that it will pique the interest of those who have started to question whether they still need a laptop. We love the design, we love that Apple has moved to a USB-C connector so you can plug in external monitors (mirrored or dual screen) and the move to Face ID is not only welcomed, it's a no brainer. There are some downsides there, however. USB-C doesn't universally support all files on external drives, there's no support for a mouse or trackpad and this can become expensive very quickly. Microsoft's ultra-portable PC is probably the closest rival to the iPad Pro, but Microsoft's machine runs the full Windows experience, so it's very much a laptop in tablet form. There's no USB-C support even in this latest model, and the screen bezels are still quite large, but it also comes with stylus and keyboard accessories and a range of processor speeds and specs to suit most needs. The Microsoft Surface Pro 6 is a really well made and great performing Windows device that looks and performs better than many of its rivals. Yes, it's the same model with the same power, storage options, USB-C and that great display, but in a much smaller package. The 11-inch in our mind is the more portable device, and while you get less screen real-estate for drawing, surfing the web, or watching video, it's more likely to fit in your bag if you are on the go. It's also a little bit more affordable.